Universal high intensity discharge flood light, 35 watt Xenon H3 lamp, size 4.725 inch width X 4.330 inch height X 5.512 inch length, internal ballast, hardened glass lens, far longer life span than halogen. 3000 to 3500 hours versus 280 to 400, higher lumen output 3200 lumens versus 700-1000 for halogen bulbs. 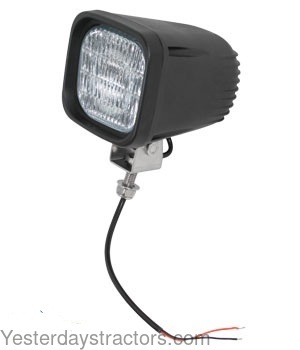 New, aftermarket Work Lamp, HID, Flood Light for sale with a solid manufacturer warranty. In addition, we have a generous 30-day return policy if this Allis Chalmers Work Lamp, HID, Flood Light for all Allis Chalmers tractors needs to be returned for any reason. Please see our Parts Warranty and Return Policy links on your left for complete details before returning. Delivery is via UPS Ground or USPS Priority and usually takes 3-5 business days. The shipping charge will be displayed in your online shopping cart. To purchase this work lamp, click the "Add to Cart" button or call toll-free 800-853-2651.